Take a classic such as Robotron; Would a similar game have any place in the marketplace today? Well, I like to think they do still have a place. We have reviewed quite a few of what I would call ‘arcade-style games‘ like The Binding of Isaac or Enter the Gungeon. Independent Finnish developers Housemarque have been making such arcade-style games since the early 1990’s and recently I read their blog, with sadness in my heart, when they declared that Arcade is Dead. Since time memorandum men and women have been living in a constant state of war, conflict and trials. The burning question which has kept us all awake at night is finally going to be considered here on GeekOut… What are the top 10 food and drinks in gaming!? Let’s find out, shall we hungry viewers? Pull yourself a smooth beverage and here we go! Who’s up for some hot stuff? 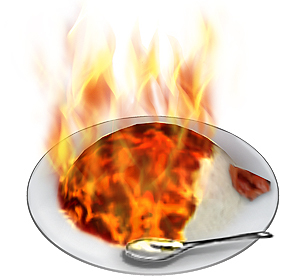 Seriously, this is some ridiculously hot curry. The best thing you can do is go to the settings and put yourself to “Curry” mode in the gameplay settings. 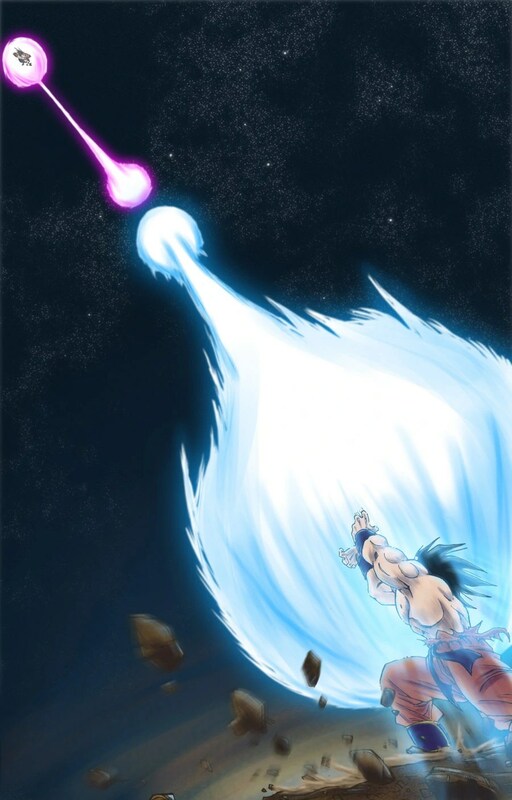 Oh yes, watching your fighters run around literally breathing fire along the way – It gets silly, it gets rather hot and bothersome… And it’s downright funny. Don’t believe me? Go boot up Brawl, set everyone to “light” weight, with bunny ears and curry. Good luck holding your breath to that one! An unapologetic game which was ridiculously tough, Zool: Ninja of the nth Dimension is one of these games that you would have heard of in nightmares if you owned an Amiga. The thing is, however the first three levels have some of the most blatant product placement in existence! That’s right, we’re on about Chupa Chups being absolutely everywhere in those first three levels. You certainly can’t forget a game like Zool when all you see are delicious sweets everywhere! Great, now I wanna get me some Chupa Chups. 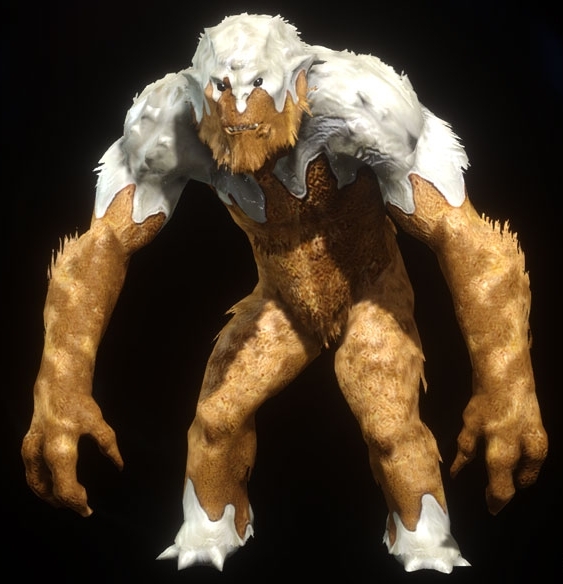 But we are so sick of being asked if someone stole our sweet roll. Who exactly do the guards think are taking them all? We’re the PC here, our first reaction when finding a new place is to steal its’ entire contents, especially the confectionary. SO STOP ASKING! And we don’t care about your previous careers or knees. Ever wondered what eating chicken from a dirty old castle would be like? I’d imagine not tasty. Now try and picture that same chicken dinner being stuffed inside of a wall which crumbles upon whipping. Now it’s a lovely chicken roast dinner covered in the rubble and ash from a whipped up wall. Delicious! I am constantly reminded of the first time I played Pokemon Red. The game was so devoid from the real world, it was beautiful! Then suddenly you see a vending machine selling Lemonade. This was the first time I questioned: What other similarities are there between Kanto, Johto, Hoenn etc and the real world? Further to this, in later games there is a ranch that sells milk… From the Cow Pokemon – Miltank! Now I’m picturing that this world keeps Torchics to lay eggs! Yikes!! But don’t worry; all of this “realism” disappears when you realise Pokemon level up to some Rare Candy… Wait, how did you all get so buff looking? Now in more varieties than ever before! Nuka Cola was the favourite beverage in the Fallout series, water being basically undrinkable in post-nuclear-apocalypse America. If you’re willing to drink the glowing variety there are some rather cool perks, including a bonus fruit flavour, and glowing urine. Nuka Cola adverts are everywhere in the Fallout universe, all of them looking strangely familiar. Nuka Cola is iconic, and the brand may very well be as recognizable as the brand it’s designed to parody. It may very well have as many varieties and related merchandize as the original these days too. It’s pretty obvious that grog will feature heavily in a series about pirates. From it eating through several metal tankards before staging a jailbreak across town, to shutting down sushi boat canals in the local Japanese restaurant, this drink not only quenches your thirst (and burns your throat to pieces) but is useful in many a situation. 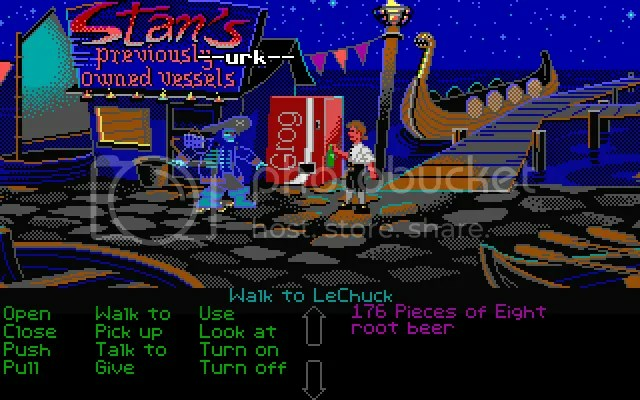 One of the friendly pirates in the Scumm Bar will even give you a recipe if you ask him nicely. But what could be better than grog? Well, root beer of course! In the first game of the series this fizzy drink is shown to have special powers that rival the extremely rare voodoo anti-root, enabling Guybrush to thwart the evil ghost pirate Le Chuck after grabbing a can from the vending machine at Stan’s Used Ship Emporium. You’ll never look at a carbonated beverage in the same way again. Seven years on we still aren’t certain whether or not the cake is a lie. Was GLaDOS ever going to give us the cake? Was it even real, or just some hallucination brought about by hurling yourself through amplified gravitic space? We know that it drove former test-subjects to write on the walls, and inspired many of us to perceive a far deeper philosophy in Portal. The game that spawned so many over-used internet jokes and memes at times still feels like the gift that keeps on giving. The sequel also delivered us the Aperture Science Incendiary Lemons! Who knows, if Valve ever work out what comes after 2, we may see another food to add to the list. 2. Super mushrooms – Super Mario Bros. In real-life you really shouldn’t pick and eat red mushrooms, but that doesn’t stop the famous mustachioed Italian plumber known as Mario – he’s such a risk-taker. Devouring these vivid fungi will cause him to double in size and strength (and his clothes to do the same! ), allowing him to smash through bricks and take an extra hit from enemies before returning to his normal short-and-pudgy size. Also be sure to keep an eye out for the green 1-Up version; you might put our hero’s well-being in danger when attempting to grab one but a successful attempt will earn lucky players an additional life. Mushrooms are obviously so super that they have an entire kingdom named after them in Mario’s world, so we think they deserve to go high on this list. No pun intended… well, maybe. So here’s something that should never have happened, a computer game to advertise a “meat” snack, peperami. Some of you (if you were in Britain at the time) may recall the adverts of the 1990’s, an angry sausage voiced by Adrian Edmondson with a foul attitude. Well, the computer game based on that character was…. actually hilarious! Graphically average for 1996, reasonably tough puzzles at times, but the voice acting and the terrible comedy made the game something truly spectacular. Ade Edmondson shines through this prolonged, interactive advert, and makes this game not only playable, but an absolute joy. Awful puns, loud abuse, slapstick, and the ability to attack whatever you like. I cannot rate this game highly enough for sheer comedic value. Sometimes even the best of foods just can’t quite make it to the top of a list. As such, we thought we couldn’t forget about these games where food is the main focus! Kirby is one hungry little pink ball and he intends to make an example out of anything he eats! Be it a Waddle-Dee or a dog that likes to freeze Kirby, the little pink ball will eat them all. Not only does he eat his enemies/”everything”, he also manages to make it look cute in the process and copy the powers of his enemies! As the phrase goes; you are what you eat! 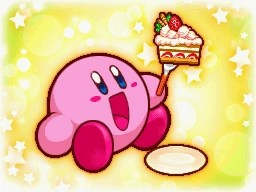 Alas Kirbys eating habits makes it a bit hard to pin-point a specific food, hence he doesn’t quite make it to the Top 10. Hang in there, little pink ball of Kirby awesomeness! Yep, we’ve copped out a bit by having the exact same thing as the honourable mentions. Pac-Man is another character whose only purpose in life is to eat everything within his sights. 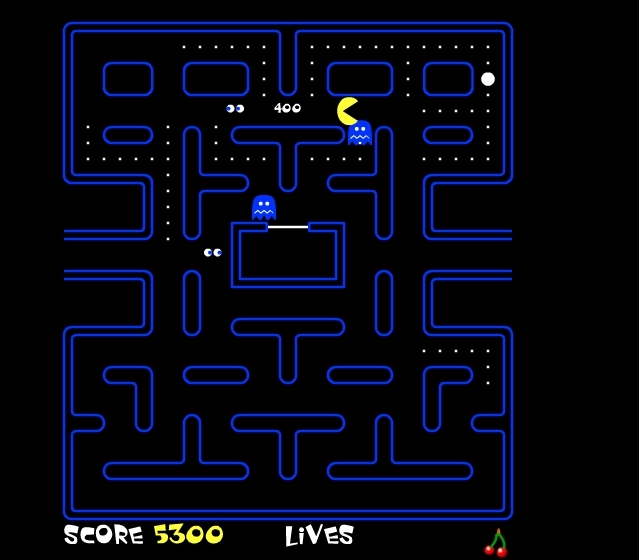 Unlike Kirby, Pacman likes to eat Pac-Dots, Power Pellets and ghosts. Yum, all of that ectoplasma-y goodness! Pac-Man also likes to remind its viewers to eat a portion of fruit every day! At least he’s harmless to us people…… Right? This week we were blessed to be joined by the lovely Kim of 1001-Up who did the Monkey Island and Super Mario Bros. sections – Thank you, Kim! Everyone else, please go ahead and check out her works over at 1001-Up today! Well, that’s it for another weeks worth of Top 10 goodness! I hope you’ve not stuffed yourself too silly on our gourmet meals and finest drinks. But don’t worry, Top 10 will be back sooner than you can spell out a French recipe with many “hors d’oeuvre”. 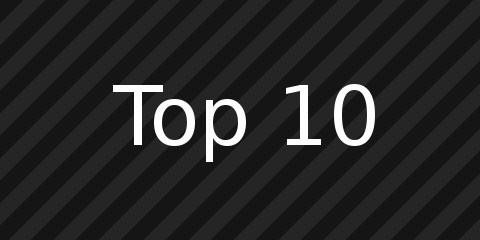 Hey, would you like to take part in selecting our next Top 10 (and special mentions)? Why not hit us up by clicking this link and dropping us an e-mail? Whether you’re an avid reader of the site or a new fan; Come take part! What did you think of our mouthwatering selection this week? We were quite happy with our selections, Timlah was especially chuffed at being able to include Zool in a list! What foods and drinks are most memorable to you in gaming? Until next time, take care! Amiga’s were personal computers that were sold by Commodore between the 1980’s and 1990’s. 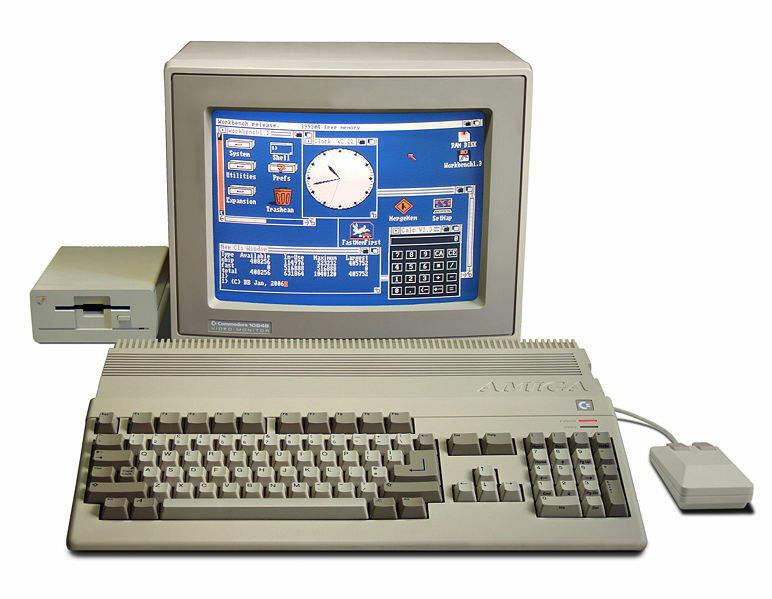 The Amiga was a high-end graphical computer which was incredibly successful for some time. With the origins of the name “Amiga” being the feminine form of “Friend” in Spanish, Amiga appears before “Apple” in manufacturer lists, which helped its success. After all, wouldn’t you like to say “I have an Amiga?” (Especially if female, as your male Spanish friends might try to correct you with “Amigo”). This is the Amiga most people know and love as this was the most successful computer of it’s time. Released in 1987, this machine was the opposite to other Amiga machines. It aimed for the low-end market, which meant more people were able to get their hands on one. Indeed, the Amiga 500 is probably the earliest example of a truly successful desktop computer. Now, the specifications would be somewhat laughable now-a-days, with 512kb of memory (Compare this to now-a-days, where machines can have 16gb+ of memory!) 7.16MHz of processing power (Compare this with modern machines which might have more than one core with more than 3GHz of processing power), you’d think that these old machines couldn’t do much. You’d have been wrong. This was, at its time, a gaming machine. It was great at what it did and was home to some amazingly popular games. A franchise called Lemmings was brought out first for the Amiga platform and became a very successful franchise. As well as this, Team17, a rather successful British video game company who makes the Worms series (Still going), started cutting their teeth on the Amiga. The shocking part of the Amiga was the fact of how far ahead of it’s competitors it was. I mean, it had Windows just about making it’s way through the world (See Windows 1.0) and it had big competition from big companies (Hello Macintoshes of the world). It was just this much of a breakthrough in technology that it was unfathomably popular for its time. Now-a-days, computing is a common subject and is very popular amongst people of all walks of life, so why was this the breakthrough? It was hard to pinpoint, but a combination of it’s great hardware support, the relative ease of an Amiga along with a great catalogue of games must have helped it. Along with this, we had software such as video production, music production and much more. The shock of the Amiga was, it was a fully fledged desktop environment. A “Single user multi-tasking operating system” which was rare for it’s time. They were around, but this whole “operating system” malarky was only just coming to fruition. Valhalla – A neat little puzzler/adventure game, where you controlled a man who “Can’t do that”. Superfrog – Team17 game which saw you as a frog. Who was pretty damned super. Putty – This game was just bizarre! Great, though! Zool 2 – A fantastically good fun platform game. Wasn’t as successful as Zool 1, which I never got to play, but Zool 2 kept me amused! The above video is for Valhalla. If you ever did an odd combination, he would look up at you and say “I can’t do that” and it used to always make me laugh. Putty’s theme – As strange as the game itself. Yes, everyone wanted to make games for the Amiga and for good reason. It was popular and it was on top of the world. So, we now know the Amiga had a strong following and some franchises/companies of reputation. Why is the Amiga still not a strong competitor? I think this’ll be a post for another day. Please, take some time to look into the Amiga and even consider getting yourself a copy of AmigaOS if you’re at all interested. It’s worth your time to enjoy what was around back then… and what was possible, even when technology was much more limiting. Related articles – Great related reads! These words are my views and possibly mine alone. Take them as gospel at your discretion, as this is in no means “right”. Now that my disclaimer is through, let us discuss what we think “Geekdom” is and why. I actively welcome conversation on this post, so please do not be shy! As you are possibly aware about the writer, he is an avid gamer, anime/manga fan and loves to get out, meet people and share little stories about life and his hobbies. With this in mind, it all changed drastically after he cosplayed for the first time! He looked to meet other local cosplayers, actively sought to meet like-minded people and started blogging his (mis)adventures. I was born in the 90’s, so was pleasured with all of the 90’s entertainment. This ranged from pop groups such as The Spice Girls, to consoles like the Playstation (PSX). I am happy to admit: as a kid, I did enjoy The Spice Girls. Why, I will never know, but hey, childhood was fun! Growing up in the 90’s, I played with an Amiga, a Windows 95 and Windows 98 personal computer. Consoles I played with were the Sega Megadrive and Gamegear, the Sony Playstation and the Nintendo Gameboy and Gameboy Colour. 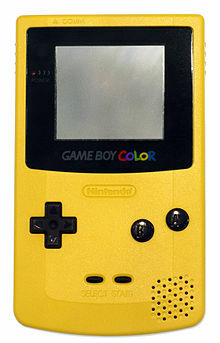 I had one that looked just like this! At this point, I would like to apologise to non-British readers who were taught American English, as you may have noticed: “colour” and “Megadrive”. I believe the equivalent to the Megadrive was the Sega Genesis. I make no apologies for using British English, however. If anything, I am proud of the differences between the two. Back on with the story! So I wasn’t without Console or PC. My Gameboy kept me amused with Tetris for hours on end, my Megadrive captivated me with titles such as Cosmic Spacehead and, dare I say it, Bubsy the Bobcat. Growing older, early 00’s, I found game design/development fascinating. I am still no coder, even though my Minecraft friends may see a different side to that and unfortunately I did not study hard enough to be a games developer. That is water under the bridge, I learn new skills almost daily through self-study. Around this time, Pokemon and Dragonball Z was every kids morning/afternoon slots. Anime took off in a big way in the UK. With the rise of the internet, it was also getting easier to find your favourite anime and share it with friends. Shops such as Waterstones started to sell more Manga novels (which used to be placed with the Graphic Novels) and it was becoming aparent that anime and manga was here to stay. TV slots for “Toonami” showed off a lot of different anime and it helped change the UKs view of Japanese animations. Yup, afternoons looked like this. I started to watch more and more anime, doodling in my spare time (never to a great quality) and generally just making my time pass. Years pass and I pass school and college. I started to play other games such ad the Trading Card Game, Magic: the Gathering. I grew up a full blown geek! This year, after many years saying I would, I attended an anime convention. Cosplaying, at that! 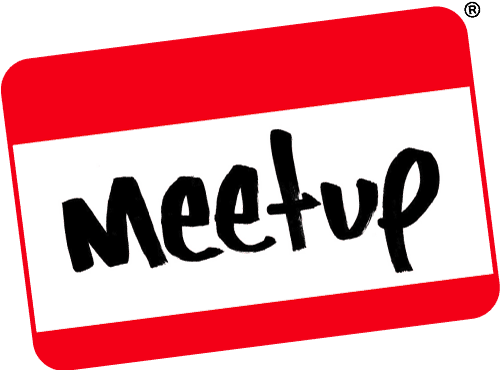 People noticed when I returned that I was even more social than usual and I ended up wanting to meet more geeks. Enter GeekOut and here we are. Carrying on with GeekOut and as you see before you, continuing the blog for GeekOut is ultimately a major goal. I am interested in what all sorts of people have to say about all sorts of subjects and I would love to hear more from people about what makes them a “geek”. Geekdom is very special and it’s something I’m proud to say I’m a part of, whether only partially or completely. That’s down to whatever someone else might view me as, but I feel I’m as geeky as a person can get. I try not to cite anything to anyone who’s not interested, but ultimately, this is why this blog is here. This is my space to ramble on about all subjects of interest to me. With this being said, I’d like to now hear from as many of you who are interested in sharing their story with the rest of us. What’s your “Geeky areas”?What makes you a “geek”? Is there anything you’re most proud of? Was you brought up “geeky”? I’d welcome any discussion on this one, so please, if you’re a geek for games, comics, TCGs, novels, whatever: Let me know! Let the world know and be damn proud of who you are. It’s why you’re worth investing time in as a person, the realisation that you are who you are and you are proud of being you. That’s, ultimately, what geekdom is here for. We acknowledge our non-mainstream interests and we acknowledge the way we go about our interests.